ENRIQUE SORO (1884-1954): Sinfonía romántica*, 3 aires chilenos, Danza fantástica, Andante appassionato*. * - First Recordings. 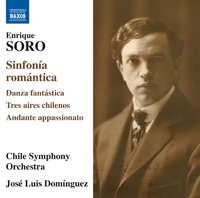 Description: Here is the first Chilean symphony ever, which Soro actually conducted with the Berlin Philharmonic in 1922, the year after its composition. It’s utterly conservative and fits into the Dvorák-Tchaikovsky groove (the scherzo will have you thinking of Lalo’s stand-alone scherzo)and will delight any Romantic symphony lover. The 1942 aires are a rare example of Soro using Chilean folk-like motifs but all of them are originals created in central Chilean tonada style. Chile Symphony Orchestra; José Luis Domínguez.